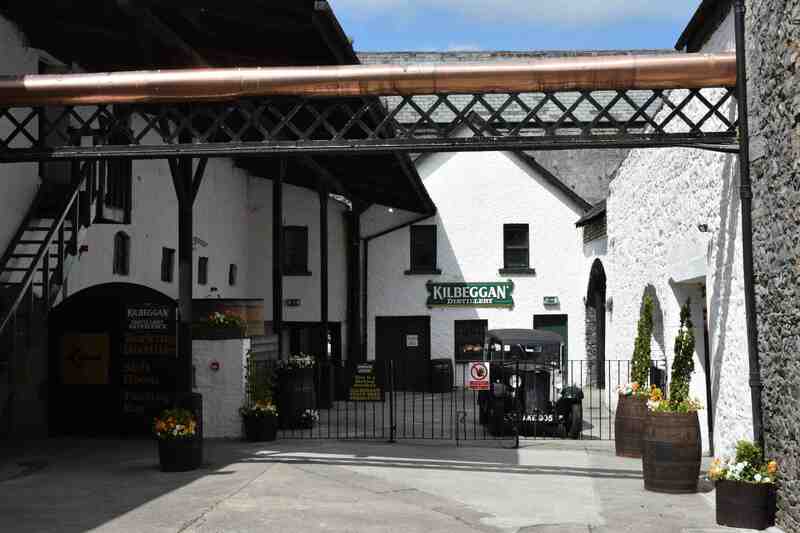 Last weekend, on my exploration of the Midlands of Ireland, I made a stop at Kilbeggan Whiskey Distillery in Co. Westmeath. Before the motorway (M6) was built between Dublin and Galway this was on the main route and is now bypassed but it is well worth leaving the motorway to stop and visit. 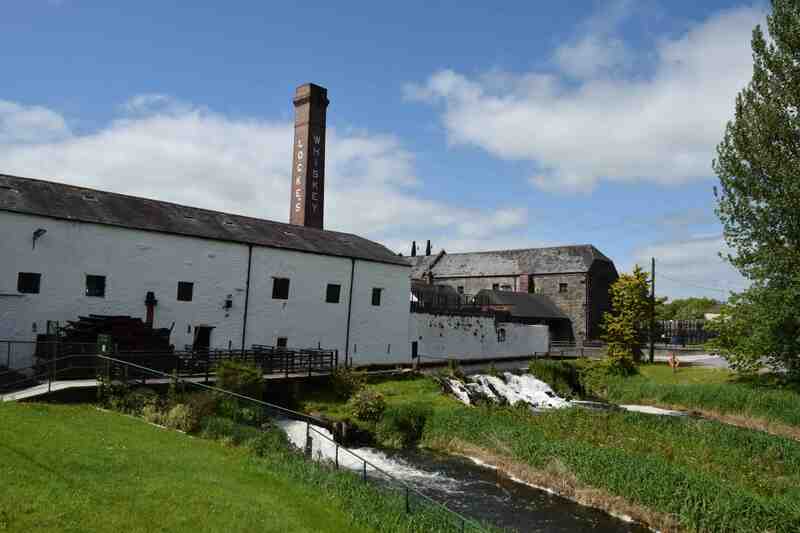 Powered by the River Brosna, it is the oldest Whiskey distillery in Ireland – what more reason do you need to make a stop here! 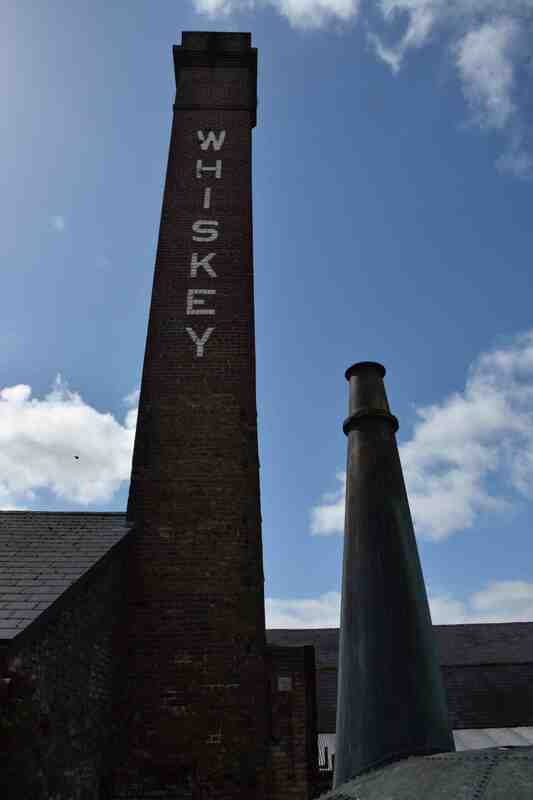 The story begins in 1757 when the distillery was established by the McManus family but it changed hands twice and the John Locke, whose name still appears on the chimney stack (above) took over in 1843 and the company enjoyed a 50 year golden era. But after the turn of the century, as Ireland went through a turbulent time, the export market to Britain was reduced, prohibition in the USA and cheap ‘Scotch’ made the product less popular, things were not so good. The company limped on until 1954 but then closed. 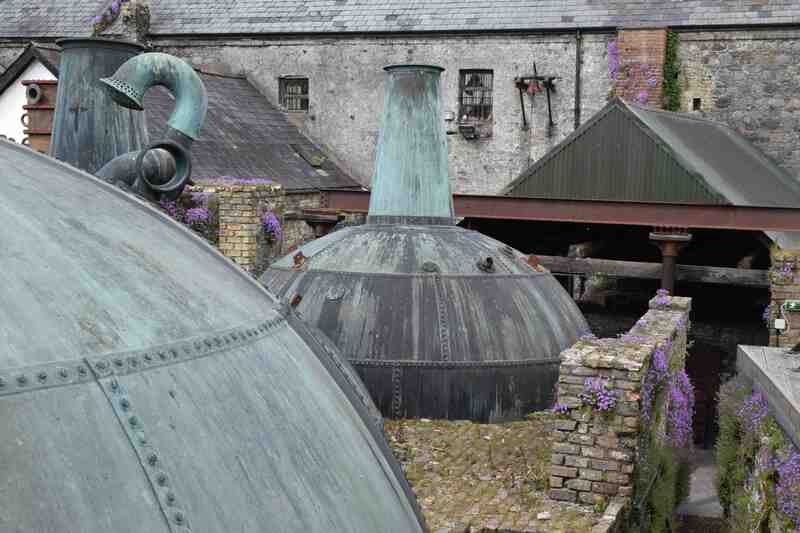 Luckily for us now, locals kept the place ticking over, if not in production, and in 1988 Cooleys took over the brand and started to use the warehouses for maturing their whiskey. In the lean years some of the old equipment was stripped out but much was left. 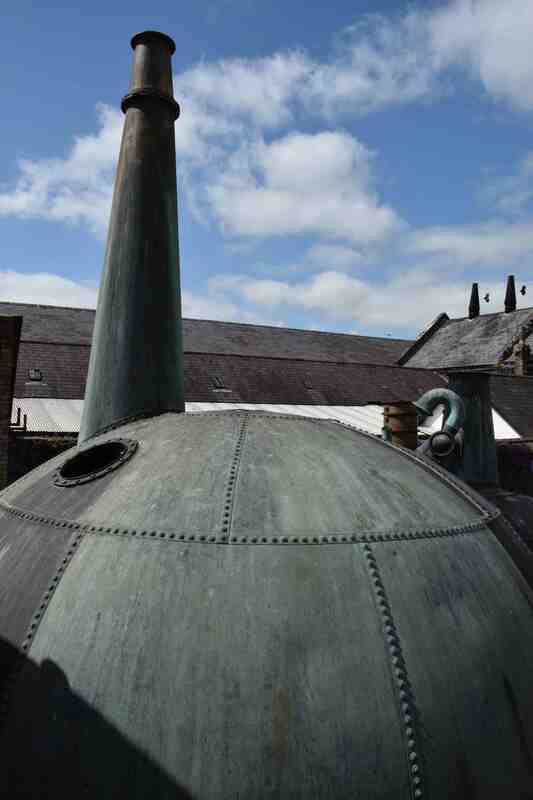 But old equipment from other distilleries was brought in and when production began again in 2007 an old copper pot still, from another distillery was used, believed to be the oldest working pot still in the world. 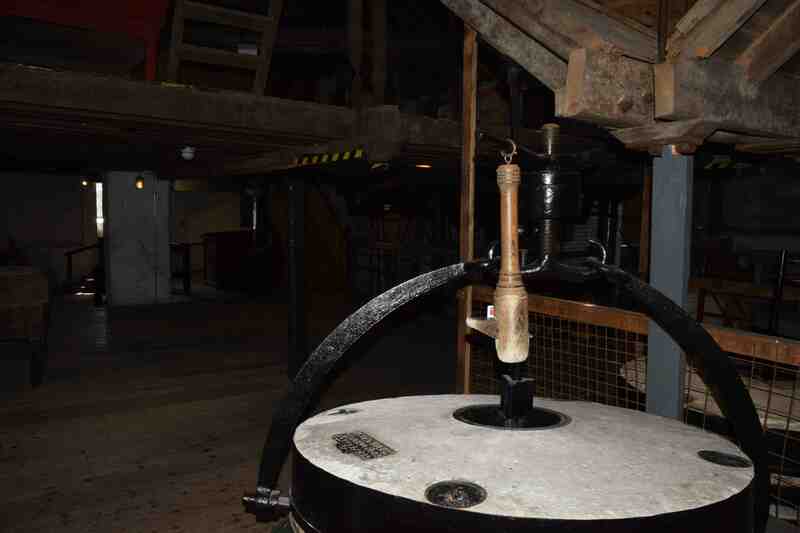 The machinery in the old part of the buildings is powered by a waterwheel though there is also a steam engine, made in Glasgow, that was used when the river flow was insufficient. Whiskey takes a long time to make – well, mature – and in the early years of this new chapter the whiskey was made at Cooleys in Co. Louth and matured here but in the past two years whiskey truly made here has been for sale. 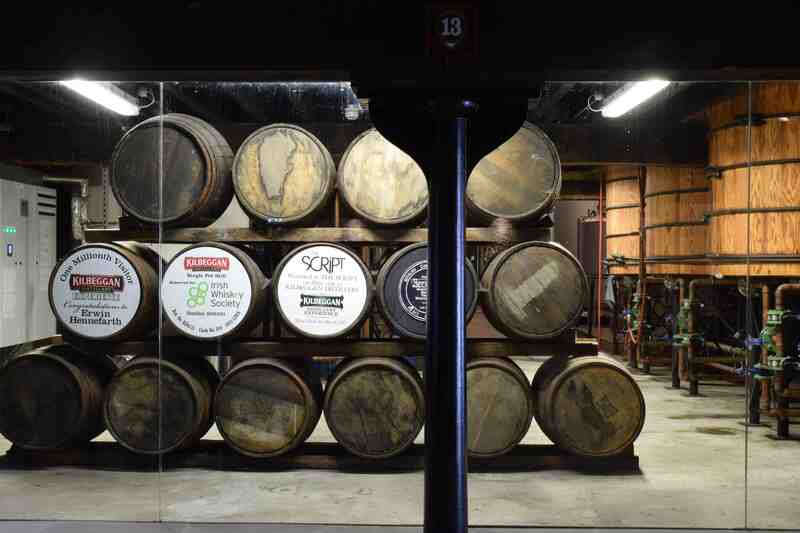 Whiskey must be matured in casks for three years before it can bear the name – before that it is just ‘spirit’. 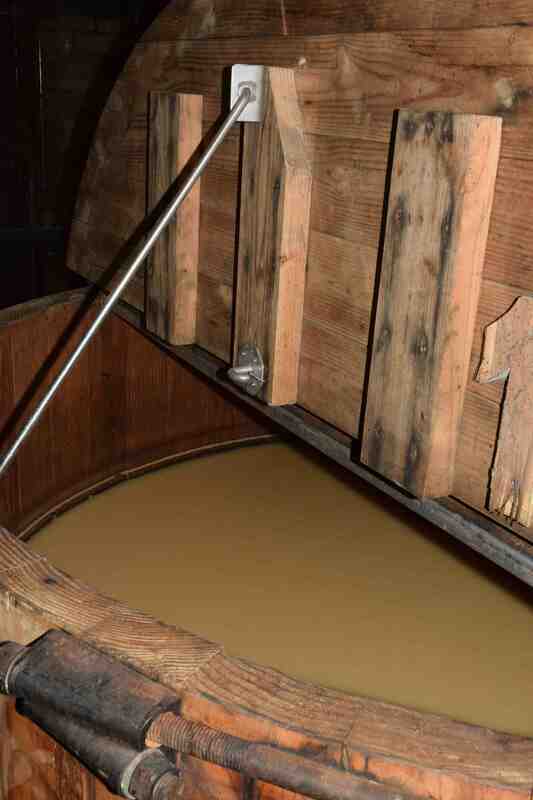 Most now is matured in bourbon casks but some is kept in sherry or port casks. It is these, and the charring of the inside of the oak casks that gives the whiskey its flavour and colour since the distilled spirit is colourless. 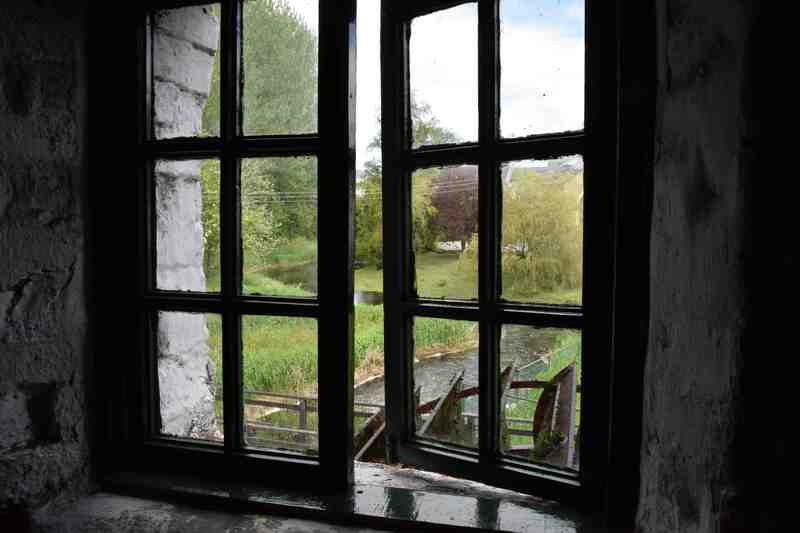 A visit costs €8.50 and you have to guide yourself around the old buildings. It is fascinating stuff but it is not that easy, in my opinion, to find your way round in the right order. But you can double back on yourself and take your time. Inevitably I was intrigued by the fairy foxglove (Erinus alpinus) growing all over the old walls. The tour ends with a tasting and if, like me, you are driving, you can take away a miniature instead. If one taste is not enough there is a bar where you can see which single malt or blend you like best and a shop where you can buy a bottle, or two. And there is an informal restaurant with good, wholesome food. Inside you can see all the old machinery like these stones used to grind the barley. Outside is the warehouse (which you do not have access to!) which is notable for being the work of Irish inventor James Waller. It is locally known as the ‘jelly mould’ and was constructed using one of his inventive techniques of hessian and concrete. One of his less successful ideas was a plan for the reconstruction of London after WW2 which included banning cars, having rubber pavements and covering the city with a lid that incorporated helipads and runways for planes – sounds intriguing and rather like The Simpsons Movie. 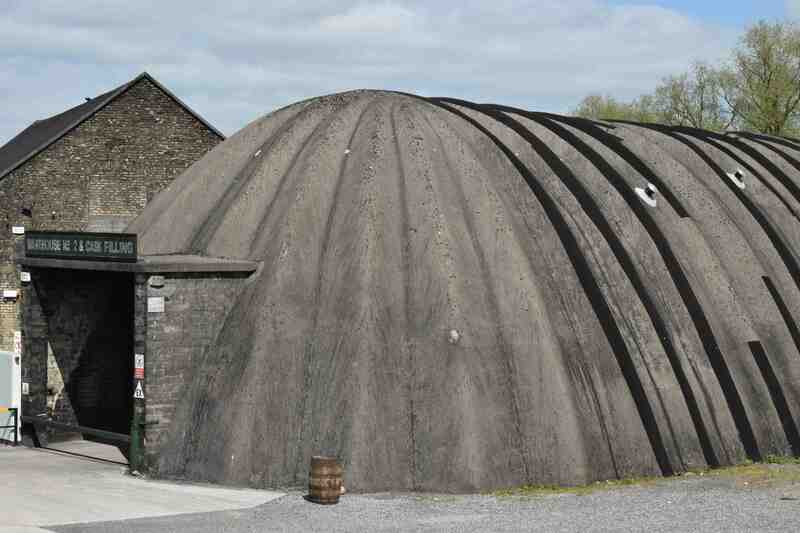 Although all the old equipment is not used today they do make whiskey here and you can see all parts of the process from the mash tuns (below) to the casks maturing. You could do the tour in as little as 30 minutes but you would get a lot more from it if you spend longer and I would allow 2 hours to include a snack and drink too. And yes, I bought a bottle! What a wonderful visit and a beautiful old site. Love the shapes of the buildings. 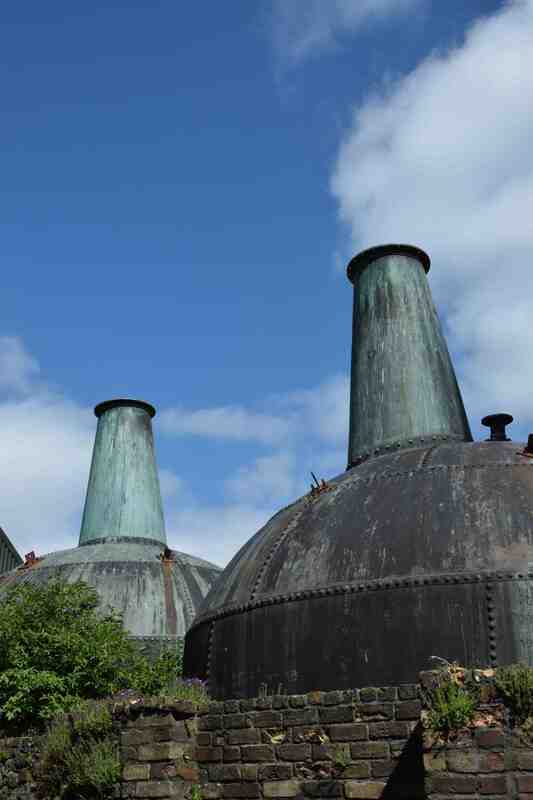 I know – i couldnt stop walking around and taking photos of those old copper stills from every angle. They look like something out of a sci-fi film – You could imagine Flash Gordon stepping out of one – drunk of course! You got a lovely day on your visit. The last few times I’ve been it’s always raining!